Wow. Two TLC Book Tours in one month! Before I go much further, I have to say that I L-O-V-E this book. In This Ground is thought provoking with just a bit of quirky artistry running through most of the characters. Much more about my thoughts on Beth Castrodale’s book later. Keep reading. Beth Castrodale has worked as a newspaper reporter and book editor. 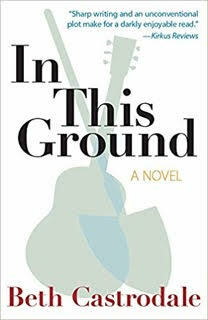 Her novel Marion Hatley (Garland Press, 2017) was a finalist for a Nilsen Prize for a First Novel from Southeast Missouri State University Press, and an excerpt from her latest novel, In This Ground (Garland Press, 2018), was a shortlist finalist for a William Faulkner – William Wisdom Creative Writing Award. Beth recommends literary fiction on her website SmallPressPicks.com, and she has published stories in such journals as Printer’s Devil Review, The Writing Disorder, and Mulberry Fork Review. Again, can I say I love this book? I’m in kind of a conundrum though because I usually do not care for novels built around a secret mystery, a mystery that when reveled leaves a bit of “Meh” in the experience. While I thought the mystery of the bandmate’s death a bit unremarkable, I think it was my connection with Ben and his family that caused me to over look that minor bit. Castrodale weaves together an unusual plot and characters. How does one connect music, art, yarn bombing, parenthood, aging, and grave digging all set in a small Massachusetts town? She achieves this and then some. Her characters are well-rounded, even the ones that we wish we knew more about like Peg the yarn bomber and Leah the artist. The setting for much of the novel, Bolster Cemetery, led me to make connections with Edgar Lee Masters’ Spoon River Anthology. There was a story with every grave, not just with the Unknown Vagrant. Although some might think the ending too tidily wrapped up, I did not. I think that even though Ben is finding relief and solace again in his art, there is much more healing and growth to occur. This book left me wanting more of Castrodale’s voice so I am picking up Gold River next (which you can get for free if you subscribe on Castrodale’s website). Marion Hartley will also be on my 2019 list. Thanks to TLC for giving me the opportunity to read In This Ground. There is actually quite a bit of food in the novel and the language used to describe it is inventive and interesting. There’s Ben’s “burrito webbed in regret” (116) and Meredith’s “increasingly suspect lassi” (40). (That lassi was definitely suspect!) The motif that kept reoccurring throughout was fungus and mushrooms, “vegetable vermin, only meant to be destroyed” (54). Mushrooms give off spores, reproduce, are cultivated, glow, and even lead some characters to major epiphanies. Fungus becomes a life focus for a couple of characters and perhaps even an avenue after death. It had to be a mushroom dish and since I am trying to recreate a recipe from one of our favorite local steak houses, I had to give this a go. Tangy and spicy: A great appetizer or side dish for steak. Combine oil, mustard, vinegar, garlic, onion powder, honey, Worcestershire sauce, and salt in a small sauce pan. Heat until honey is dissolved and mixture is combined. Clean and cut mushrooms in half or quarters (if they’re large). Pour liquid over mushrooms. Refrigerate for 24 hours before serving. The original recipe, “Molly’s Landing Marinated Mushrooms,” can be found in The Route 66 Cookbook by Marian Clark. I made these for New Year’s Eve as a side for short ribs. Unfortunately, they never made it to the table. We ate them all while we were preparing dinner (and having wine). This recipe will stay in our recipe rotation and in fact, I may just keep a tub of them in the refrigerate from now on! 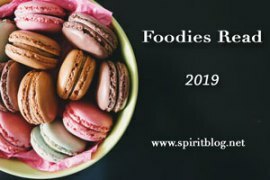 I am linking up with Foodies Read for 2019! Please check out the other stopovers on this book tour. Mushrooms are so good for us. I can’t wait to try this marinated mushroom recipe! Thanks, Angie. Hope you try it and put your own spin on it! Thanks for another great book review! I can’t find it at my library so I’ll visit her site. Interesting names for some of the food in the book and for the mushroom recipe. I never think of using mushrooms in an appetizer, but these look wonderful. Mushrooms — always a good idea! Last night we had mushrooms browned in butter and then mixed with sour cream (off heat). 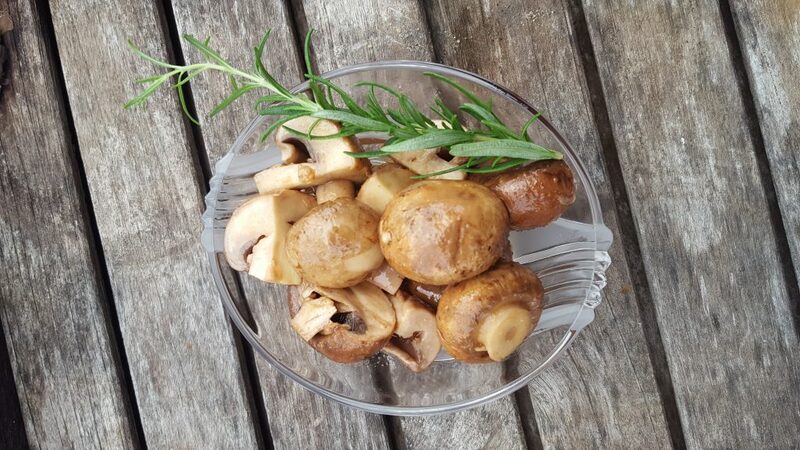 We love Provencal mushrooms, champignons à la Greque, mushrooms in any stew, mushroom omelets. Can’t go wrong! That recipe looks delicious! I like the food descriptions you quoted – it makes me want to give this book a go. I’m surprised the mushrooms were as good as you say since they look plain. Looking at the recipe ingredients I am undoubtedly wrong. I do enjoy putting mushrooms in a stew so I’m curious if I would like those marinated mushrooms alone. Even if you didn’t like the mystery, the author’s ability to jam in all those topics in cohesively is rather impressive. 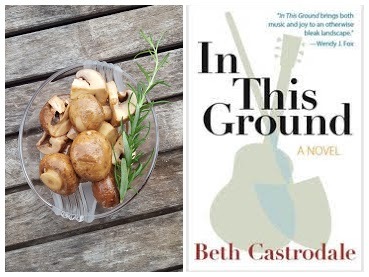 Thanks for the book recommendation….and I think I could easily eat a batch of these mushrooms! Thanks for the review Deb and for the info on the free book. I ordered it up. Love those mushroom! It’s a unique blend of ingredients for them, sounds delicious! I love this!! I had so much fun reading this book. I wish I liked mushrooms! If I did I would definitely check that recipe out. Mmmm, mushrooms! Love ’em. And they’re terrific when marinated — this looks like a good recipe. Sounds like an interesting read, too. Thanks! The book and the marinated mushrooms both sound great! Will have to give them a try. I love mushrooms! Ahhh!! SO glad you loved the book, and the mushroom recipe sounds amazing. THANK YOU for being on the tour!